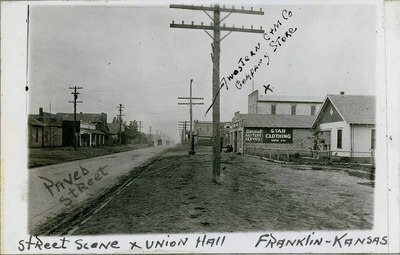 Black and White photograph of the Western C & M Co. Company Store, Union Hall, and various buildings in downtown Franklin, Kansas, in 1923. Digital image copyright 2014, Pittsburg State University. All rights reserved. For more information contact the Leonard H. Axe Library Special Collections, PSU, Pittsburg, KS 66762.